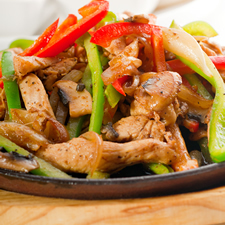 In a large skillet, saute peppers and onions in remaining oil until crisp-tender. Remove and keep warm. Serve with Tortillas and toppings. Per Serving (does not include toppings): 263 Calories; 8g Fat (28.3% calories from fat); 2g Saturated Fat; 30g Protein; 17g Carbohydrate; 11g Dietary Fiber; 66mg Cholesterol; 620mg Sodium. Exchanges: 0 Grain(Starch); 3 1/2 Lean Meat; 1/2 Vegetable; 0 Fruit; 1 Fat; 0 Other Carbohydrates.